FOR JUST $39 A MONTH, OUR LIVE AGENTS WILL ANSWER THE CALLS YOU CAN’T! Rapid call pick-up – calls answered in just three rings or less! HOW IS A PHONE ANSWERING SERVICE BENEFICIAL TO MY BUSINESS? The benefits of getting Answer Our Phone’s phone answering service are endless. One of the primary benefits you can get is that we grant your current and potential customers access to your company even during off-hours! You will rarely find a small business open 24/7, so this makes it increasingly important for you to establish 24/7 access to live representatives for your customers. This is exactly what you can get with Answer Our Phone’s leading phone answering services! You can miss out on a lot of valuable business opportunities due to unanswered phone calls. Customers expect to talk to a human being when calling. So when they are greeted by an answering machine, they might get irritated with your service. Other problems arise when companies try to rely on voicemail. Once an automated message is heard, most callers will likely hang up and not leave a message for you. If they can easily contact your competitor who can answer them right away, why should they wait for you? Another issue that you may encounter with voicemails is when customers in need of urgent services call. If you don’t have a human operator available for your phone, these clients will likely call your competitors instead. They will simply look for the first company who can answer their call! For a high quality alternative to an impersonal and automated message system, you can turn to Answer Our Phone’s virtual receptionist service! Focus on your strengths and your core business. Leave the unanswered calls to us, and do what you do best for your business! 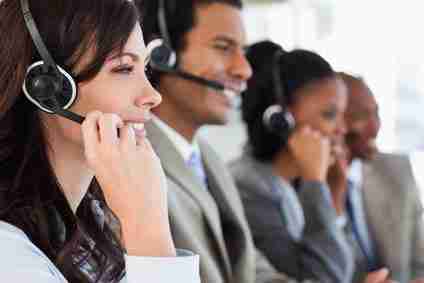 You can rely on Answer Our Phone’s live call center agents. We operate in a smooth, efficient manner to guarantee that your calls will never go unanswered again. If you or your staff members can’t attend to a call, one of our friendly and professional representatives will pick it up. Our US-based operators will follow the script you provided to us, and they will take messages from your callers. Answer Our Phone staff will also collect customer information for you, and we will notify you about the message via fax, text, or email, depending on your preferences. After receiving the message, you can then determine how to handle the business call. Customers calling after regular business hours? Clients calling when your business already has a call overload? Don’t worry. You can count on Answer Our Phone’s services to answer those calls respectfully and professionally! By signing up for our service, you can lessen the chances of missing business opportunities just because of unanswered calls. With prices starting at just $39 per month, our very affordable rates can get you some of the best phone answering services in the country! Many business owners think that they can rely on overseas operators for their answering services. Yes, they have cheap rates, but those come at a cost. Your callers might experience communication barriers with overseas operators, which defeats the whole purpose of hiring an answering service. Don’t rely on companies using overseas operators for their answering service. Instead, choose Answer Our Phone for the high-quality, US-based service that you need for your business. ARE YOU READY TO TRANSFORM YOUR CUSTOMER SERVICE? A 2011 Consumer Reports study says that customers get more ‘irritated’ by the inability to talk to a live, human person on the phone compared to confronting obnoxious salespersons. This just highlights the need to have human agents to answer your calls! If you’re ready to benefit from the top phone answering service available, you can easily sign up below! If you have any additional questions, please feel free to contact us before you decide to sign up with Answer Our Phone!